The workshop was held within two sessions of the second day of the First European Platform Economy Summit in Berlin. The first session was a workshop called “New Ecosystem Opportunities & 'White space' Opportunities in Software and High-Tech“ and the second session was a panel about “Network Effects, Data Effects & AI - Keys to the castle“ moderated by Slinger Jansen. You can find more details on both sessions below. What made this workshop successful were the discussions about the presentations but also the interactions in breaks and during lunch. A big thank you goes out to all presenters, helpers and participants! This design-thinking based workshop featured three short motivating presentations by Peter Buxmann, Sebastien Dupre and Thomas Curran followed by topic-based, hands-on workshops. Thomas captured the audience by describing his recent success with creating new cloud based ecosystems for digital business in the financial industry. In a traditionally closed industry, what do you do to turn a company into a digital, open platform? Thomas had done just that in a three year project and talked about how to do that successfully. Peter reported about several studies on the value of data and the importance of privacy. He provided insights into challenges and success factors for software platform providers regarding the value of customer data, customer privacy and tradeoffs between data privacy and data farming by platform providers. Sebastien showed how Uberization in field service management works by engaging a crowd of service technicians inside and outside of companies. He explained how companies can build an ecosystem connecting field service technicians, partners, own employees and customers to scale their field service operations, increase revenue and provide unmatched customer experience. Then we split the crowd of thirty people into three teams that worked together and discussed with the help of the moderators and our design thinking coach Olaf Mackert. First, we ran an introduction game called two truths and one lie, which created a lot of laughter and made everybody ready to work together trustfully. Then everybody dumped his ideas, questions, issues he or she wanted to discuss on post-its, which were clustered into topics by the moderator. Then the teams voted on the topic to start with. The discussions went on in five minute slots. The team voted on either continuing the discussions on the topic or going to the next topic after each slot. Thomas Curran´s team, which was the largest team, focused on the technical aspects of creating a platform and technology selection. They had lively and productive discussions leveraging the joint wisdom of the team. Sebastien´s team of ten discussed topics around uberization of any industry and about changes in strategies for field service management. Peter Buxmann´s team was a diverse team made up of members from venture capital, manufacturing, public administration which made discussions very interesting based on the different views. The team addressed question around motivations of people to share data, ways to create value from data and also around data protection impact on data-driven business models. The results of each team will be provided in a short writeup from the moderator. John Rethans, head of Digital Transformation Strategy from Apigee/Google, brought everybody on the same page regarding APIs - what they are and what it means to implement an API driven strategy and technology. new risks that remain under investigated. The proceedings of EWSECO are out now! 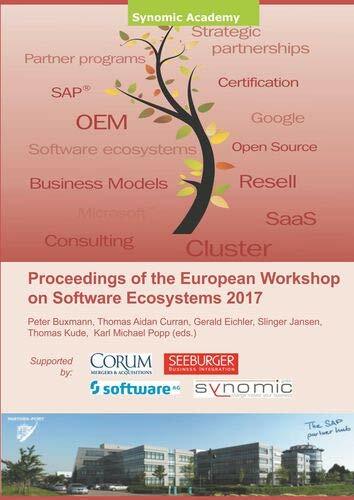 The European Workshop on Software Ecosystems http://www.ewseco.org is an annual event which connects researchers and fellow professionals in the field of software ecosystems.